Las Cruces, N.M. — A final design for the downtown civic plaza got the go-ahead from city councilors on Monday, setting the stage for the transfer of ownership and for the groundbreaking at the site of the Bank of the West drive-thru. The council in a 4-1 vote adopted a few site plan changes that had been recommended by Mayor Pro Tem Greg Smith, who has a background in architecture, but rejected others that he proposed. Overall, the adopted changes to the previously existing plan were small enough to avoid further delaying the project, the plaza developer and designer said. Plaza design consultant Susan Henderson of PlaceMakers, said the work could get underway in “less than six months,” depending on how long it takes for the impending sale of land for the plaza to be completed. Developer Bob Pofahl of Las Cruces Community Partners said the changes approved by councilors on Monday will require some tweaking of architectural and engineering plans, but not large-scale changes. Las Cruces Community Partners has a contract with the city to buy the land for the plaza from Bank of the West and to build the improvements for it. “It was a key step forward,” Pofal said of the vote. A change proposed by Smith that was passed by councilors was related to the artwork for two key features in the plaza proposal: a water splash pad on the north end and a sun dial planned to be built into the pavement at the center of the courtyard. Smith proposed holding off on the final appearances of those features so the city can find an artist or artists to design them. Henderson said LCCP would basically leave space in the plaza for the artwork to be added, either in conjunction with the construction or after it. Councilors also adopted Smith’s proposal to incorporate one of two utility boxes for the plaza into the design of the stage. Smith had sought a revamping of the architecture for a second utility box proposed for the northwest end of the plaza, but other councilors didn’t support it. 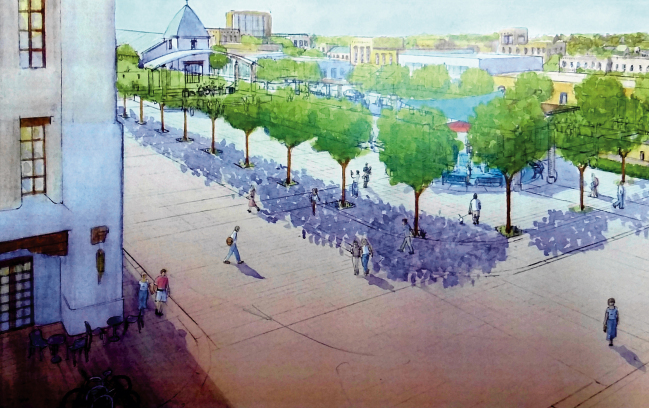 They also didn’t back Smith’s proposals to eliminate one of two proposed new streets that would line the east side of the plaza or to shrink the size of a planned stage for the plaza. City staff said, however, it’s possible for the street to be closed off to vehicles when it’s not needed. Smith, in a presentation to the council, said he wanted to avoid mistakes of decades past when an attempt to revitalize downtown failed. He also said he wanted to avoid mistakes made in other civic plazas, such as Albuquerque’s. He said he didn’t feel councilors had been given enough input into the proposed plaza design before Monday’s meeting. “The process to this point has not been as inclusive as I would have liked it to have been,” Smith said. Henderson argued against several of Smith’s proposals, saying the existing design was crafted after a lot of public input over the past two years. It also incorporated some City Council-supported additions, such as the proposed water feature. Doña Ana County Commission Chairman Billy Garrett, a non-voting member of the TIDD board, said he thought councilors were on the right track with the plaza design. Hilary McDaniel-Douglas, artistic director for Project in Motion, a nonprofit aerial dance group, advocated for the stage to be built to accommodate aerial dancers and other types of unique performances, which are becoming a trend. “There are a lot more nontraditional forms coming in,” she said. McDaniel-Douglas said she was also concerned about the use of paving stones in the plaza, which can be hazardous to dancers. Smith proposed using pavers or bricks as the plaza’s main surface, instead of scored concrete in the existing plan, but that proposal didn’t gain attention. Former Las Cruces Mayor Ruben Smith, unrelated to Greg Smith, asked if the roof of the planned performing stage could be angled to boost the acoustic projection. Henderson said that could be included. Also, she said steps will be added around three sides of the plaza, a request of Smith’s. There was also debate about the type of trees that should be planted in the plaza. Some people advocated for cottonwood trees, which would give off maximum shade but use more water than the alternative, Chinese Pistache tree. But Garza said he recommended the Chinese Pistache, which has a smaller canopy but is one of four tree types on a list of recommended trees for planting in the city. City Councilor Miguel Silva participated in the meeting by phone. Councilors Olga Pedroza and Ceil Levatino were absent.